Tonight Question Time comes from Grimsby. It’s a 10:30pm kick off and afterwards we will suffer the maddess that is This Week. Don’t forget to look for Blue Nun Bingo updates on David Mosque’s website dedicated to the game here. Tonight Question Time comes from St Andrews. On the panel tonight we have Conservative leader in Scotland Ruth Davidson, Charlie *hic* Kennedy, Labour rebel Frank Field, Scottish National Party MSP Humza Yousaf and irritating toothy professional whinger Janet Street-Porter. It’s a 10:30pm kick off and afterwards we will suffer the maddess that is This Week. In the past it’s been fair to say that QTs from Scotland have brought out some quite strong views from Commenters here. These days; satire, wit, banter and amusing heckling are welcome as always but plain abuse won’t get past moderation. Tonight Question Time comes from Guildford. David Dimbleby is joined on the panel by Sec of State for Local Govt Eric Pickles (presumably on a reinforced chair), Shadow Sec of State for Energy and “Climate Change” Caroline Flint, Daily Mail columnist and UKIPper Janice Atkinson-Small and Will Self. Oh, and well known political commentator and philosopher Will Young. Unbelievable. Although it’s good to have two elected frontbenchers on again. Not often that happens. For those who enjoy the Blue Nun Bingo whilst watching This Week (and also for those who don’t understand it) take a look at David Mosque’s website dedicated to the game here. 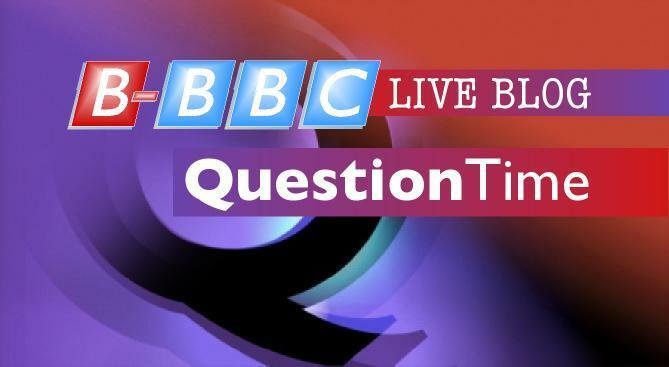 Tonight Question Time comes from Dewsbury; home of Mohammad Sidique Khan who was ringleader of the group responsible for the 7 July 2005 London bombings. David Dimbleby is joined on the panel by ex Sec of State for Wales John Redwood, Rachel Reeves (who likes wedding cakes and flower arranging), Nick Clegg’s PPS Jo Swinson, historian Prof David Starkey and footballer Clarke Carlisle (making his 2nd QT appearance after previously appearing on 20 Jan 2011). It’s a 10:30pm kick off and afterwards we will suffer the maddess that is This Week. It’s not Jacqui Smith this week. We’ve got ex-Marxist Alan Johnson instead. Joy. Tonight Question Time comes from Tunbridge Wells. David Dimbleby is joined on the panel by Minister for Culture Ed Vaizey, Shadow Attorney General Emily Thornberry, UKIPs Paul Nuttall MEP, journalist Cristina Odone and dreary lefty Simon Schama. It’s a 10:30pm kick off and afterwards we bid a welcome return to the maddess that is This Week. Unfortunately there’s a return for the odious Jacqui Smith but you can’t have everything. For those who enjoy the Blue Nun Bingo whilst watching This Week (and also for those who don’t understand it) David Mosque has created a website dedicated to the game here. Awesome effort and well worth a look. Tonight Question Time comes from Nottingham. David Dimbleby is joined by Ken Clarke, John Prescott, LibDem Susan Kramer, businesswoman Julie Meyer* and a random lefty freak called Owen Jones. In fact ignore that last link – you’ll just encourage him with the hits on his blog. So with the possible exception of Julie Meyer that means no-one right of centre on the panel tonight. Oh dear. Your Moderators line-up consists of David Mosque, TheEye and John Ward. David Vance has taken the awesome option of heading out to a concert tonight. I suspect we will all envy him within minutes of kick-off. It’s a 10:30pm kick off and there is no This Week afterwards so drinking can be focused and intense. See you here later! UPDATE: For those who enjoy the Blue Nun Bingo whilst watching This Week (and also for those who don’t understand it) David Mosque has created a website dedicated to the game here. Genius. No other word for it. Genius. Tonight Question Time comes from London. David Dimbleby is joined by Defence Secretary Philip Hammond, Alastair Campbell, Shirley Williams (apparently not dead yet, it seems), Alan Partridge Steve Coogan and journalist Ann Leslie. Just an observation – only one elected person on the whole panel? Really? Your Moderators line-up consists of David Vance, David Mosque, TheEye and, hopefully, John Ward. It’s a 10:30pm kick off and we’ll be staying open for This Week too. See you here later! Tonight Question Time comes from Southport. David Dimbleby is joined by Southport by International Development Minister Alan Duncan, Shadow Justice Secretary and frequent Guido target Sadiq Khan, Labour ex-Minister Digby Jones, Emma Boon from the TaxPayers Alliance and Grange Hill writer Phil Redmond. Tonight Question Time comes from Plymouth. David Dimbleby is joined by Conservative MP Liz Truss, Lib-Dem Foreign Office Minister Jeremy Browne, Labour’s David Lammy, ex Socialist Workers Party member Mark Steel and Mail columnist Melanie Phillips. Your Moderators line-up consists of David Vance, David Mosque and TheEye. Tonight Question Time comes from Shrewsbury. Welcome back to the Biased-BBC Question Time Live-Chat! We resume after the Christmas break with a classic line-up of typical BBC fodder. David Dimbleby is joined by Secretary of State for Transport Justine Greening, Shadow Foreign Secretary Douglas Alexander, Deputy First Minister for Scotland Nicola Sturgeon, Minister for Pompous Smugness Paddy Ashdown and editor and broadcaster Kelvin MacKenzie. This week sees your usual regular Moderators line-up of David Vance and David Mosque. TheEye is back permanently as of tonight and is looking forward to getting back into the fray. Question Time tonight comes from Stoke-On-Trent. On the panel Conservative PPS to the Defence Secretary Claire Perry, Labour MP Tristram Hunt, black part-time judge Constance Briscoe, Chief Executive of Next Lord Simon Wolfson (who takes the Conservative whip) and nutty race-baiter Mehdi Hasan. It’s been a long time since the panel has been so spectacularly unspectacular. Honestly, you wouldn’t recognise a single one of them if they stood next to you on the Tube. Today is General Election day in Gibraltar so TheEye has been hobbling around on crutches wearing a rosette all day. I will try to join the chat Moderation panel from the count via the BatPhone but no promises as I’m moderating a similar chat on the Gib results at the same time. Busy busy busy. And not in a good way. Question Time tonight comes from Dagenham. On the panel Ken Clarke, Chuka Umunna, someone from Dragon’s Den called Deborah Meaden, Canadian-American journalist David Frum and union boss Mary Bousted. So David Frum is the token right-winger. Nobody would ever accuse Ken Clarke of filling that chair, could they? Question Time tonight comes from Bath in Somerset. David Dimbleby is joined by the splendid Daniel Hannan MEP, Chris Huhne (who may or may not be driving there; the CPS can’t decide), a person called Liz Kendall who is apparently Shadow Minister for Old People, the Sainsbury’s CEO Justin King and notorious self-publicist and Wikipedia front-man Jimmy Wales. Question Time tonight comes from Newcastle upon Tyne. On the panel we have Nadine Dorries, the Sec of State for Scotland and LibDem Michael Moore, the Shadow Chief Sec to the Treasury Rachel Reeves, neurobiologist Professor Colin Blakemore and Stephen Pollard, editor of the Jewish Chronicle. Could be an interesting one this week. TheEye is able to join the Two Davids…Vance and (hopefully) Mosque…in the Moderators balcony tonight, so we all look forward to seeing you at 10:30pm!